We’re going to do the live stream again on Sunday, December 18. Keep an eye on Cruise Hive for more details and exact time. Due to a malfunction, the live stream is not able to take place. Sorry for any inconvenience, we’re just going to have to wait a little longer to feed our cruise ship addiction. We’ve included a previous live stream in PortMiami to make up for it. 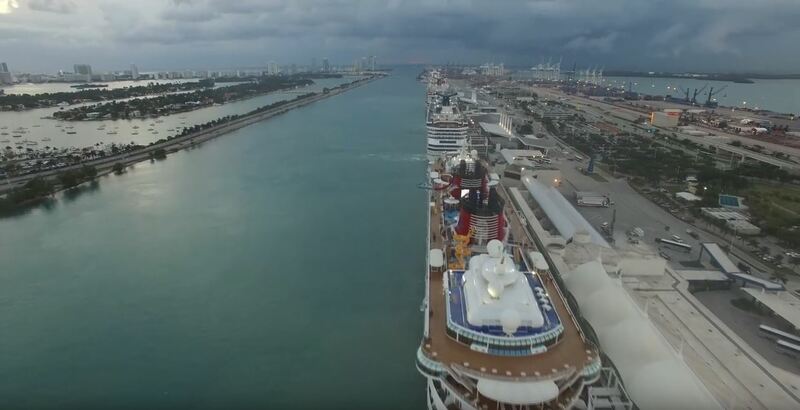 We thought why not give our readers some iconic views of PortMiami with cruise ships departing live. We’ve teamed up with our friends at Miami Drone Flights to bring you a live broadcast which will start no later than 5:10 PM Sunday, December 11. If you miss the live footage above you can still simply “play” and watch it back. Today there are 6 cruise ships in PortMiami including the Adiavita, Carnival Vista, Celebrity Eclipse, Disney Magic, Insignia and Norwegian Getaway. All the ships are departing after 5:00 PM to begin their Caribbean itineraries. Highlights include the new and largest ship from Carnival Cruise Line, Carnival Vista just recently started its year-round service from Miami. Norwegian Getaway operated by NCL is the biggest ship of the day and a huge 145,600 gross tons. I’m going to cruise around the western end of PortMiami. With a special eye for one of the magnificent Cruise Liners using its thrusters and rotating 180 degrees to face East as it will then steam down Government Cut on their way to the mighty Atlantic Ocean. I could catch the Norwegian Getaway, The Celebrity Reflection or maybe even the Brand New Fabulous Carnival Vista. I will not wait for any ship in particular. This stream will definitely start no later than 5:10PM. Miami is the cruise capital of the world and is constantly busy with cruise ships. We often get to see some of the newest and biggest vessels at the port, on some days all the cruise terminals are dealing with thousands of passengers. Sit back relax and watch the stunning drone live stream. We’ll enjoy a view of the port as the ships depart. Who knows what ships we’ll catch and where the wind takes us! Feel free to post comments further down below and any suggestions on future Miami videos. If you’re waiting for the live stream to begin you really should watch some previous drone footage of PortMiami.